The Best Star Wars Giveaway in the Galaxy. Enter You Will by May 7, 2019! Our latest out-of-this-world promotion – Anaheim Star Wars Quest – the Best Giveaway in the Galaxy – just might give you and your star crew the chance to join the legions of fans who’ve been waiting to experience Star Wars: Galaxy’s Edge, scheduled to open summer 2019. It’s the newest major attraction to land at Disneyland® Park, and is scheduled to feature a smuggler’s journey aboard the Millennium Falcon, a first-hand visit to Planet Batuu and a face-to-face confrontation with the First Order. But you must enter Anaheim Star Wars Quest by May 7, 2019 to be eligible for the May 10, 2019 drawing. Anaheim Star Wars Quest valued at more than $2,100*! 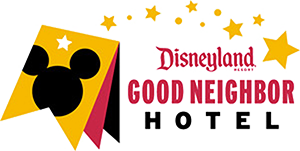 Enter to win the Anaheim Star Wars Quest and receive a special offer code and online booking link for 15% OFF your stay at Anaheim Majestic Garden Hotel per night. Book before June 18, 2019, for reservations through December 2019. Come live your very own Star Wars™ story in a whole new land where a galaxy far, far away unfolds all around you. Welcome to Star Wars: Galaxy’s Edge, opening May 31, 2019. Around corners and through back alleys, you can build your own droid and custom lightsaber and sample the curious concoctions of the local cantina. Then, gather your crew and take control of the fastest hunk of junk in the galaxy on Millennium Falcon­­­: Smugglers Run. And, after opening later in the year, find yourself caught in an epic battle between the Resistance and the First Order in Star Wars: Rise of the Resistance—where the incoming laser fire of a towering AT-AT is matched only by the red crackle of Kylo Ren’s lightsaber. Soon the time will come to live your adventure at Star Wars: Galaxy’s Edge. Disclaimer: Reservations and valid Theme Park admission required to visit Star Wars: Galaxy’sEdge between May 31 and June 23, 2019. Capacity for Disneyland® Park, Star Wars: Galaxy’s Edge and its experiences is limited. Access to the Park, land and experiences may be restricted or unavailable depending on Guest demand and other factors. Star Wars: Rise of the Resistance attraction opens later in the year. Only one entry per family is allowed. * Does not include taxes or gratuities. Prize package has no cash value and items cannot be exchanged for cash or other offers. Blackout dates apply. Please review the Anaheim Star Wars Quest – The Best Giveaway in the Galaxy rules and restrictions. ** Dream Machine Shuttle included with daily room reservations.